The Nursery is led by Laura Cosgrove (teacher), who is in charge of the EYFS in the school. Helen Roberts (teacher) works in the Nursery Mondays to Wednesdays. Katy McQuilkin (teacher) works in the Nursery Thursdays and Fridays. Sarah Johnstone is a qualified Early Years Practitioner and works full time in the nursery. Toya Anderson is a qualified Early Years Practitioner and works Monday mornings, Tuesdays - Thursdays all day and Friday mornings. At Nursery we follow the Early Years Foundation Stage curriculum which is divided into 7 areas, which are further divided into 3 prime areas (physical development; personal, social and emotional development; and communication and language) and 4 specific areas (literacy; mathematics; expressive arts and design; and understanding the world). 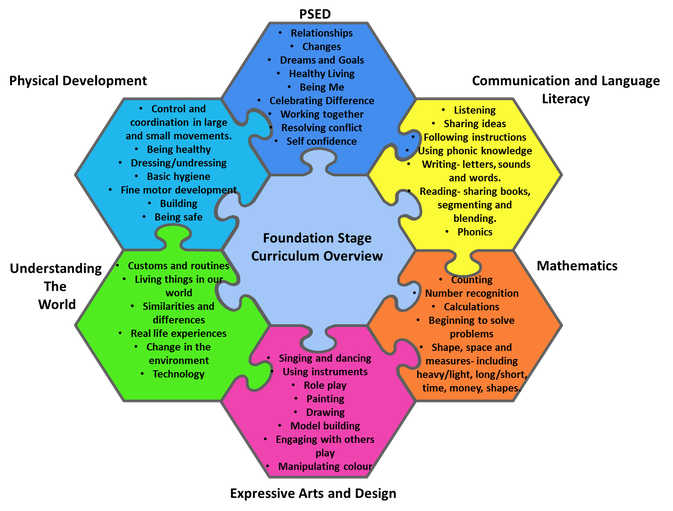 The picture below shows the learning that falls into each section.